SSS member Ben Lane Patterson, Jr. MajGen, USAF headed west peacefully at his home on August 8, 2016 in Rutledge, GA. He was born in Millen, Georgia in 1929 and later moved to Waycross, GA where he attended high school. He was a graduate of the Military Program of North Georgia College and there, earned his commission in the United States Air Force. Upon graduation, he attended USAF Pilot Training where he earned his pilot’s wings and qualified as a fighter pilot. He served in Korea in 1951-1952 with the 158th Fighter Squadron. He flew 101 combat missions in F-51’s and earned the Distinguished Flying Cross Medal. Upon his return to the U.S., he entered UGA Law School and graduated with a Juris Doctor in 1955. Throughout his life, there was probably no other Georgian as dedicated and as much of a fan of the Georgia Bulldogs as Ben Patterson! He briefly practiced law but was sought after by the 158th Fighter Squadron in Savannah, Georgia. He accepted this offer and moved his family to Isle of Hope. During that period, he flew the F-84D, F-86L, C-97 and C-124C aircraft and obtained the rank of Lieutenant Colonel and led the 158th flying program. He lead the 116th Tactical Fighter Wing located at Dobbins AFB, as the Full Time Air Commander in its conversion from transport to Fighter aircraft. A few years later he became the Full Time and Overall Wing commander of the 116th Fighter Wing. It was in this position that he was promoted from Colonel to Brigadier General. He remained with the 116th for 10 years, flying the F-100D, F105G, F-4D and F-15A aircraft. In 1983 General Patterson became the GA State Adjutant General of all of the Georgia Air National Guard with 11 units and approximately 3,400 airmen and officers. He remained in this position until his retirement in 1991. After his retirement, he continued serving the State of Georgia using his law degree serving as a Magistrate Judge in Waycross from 1991-1993. Patterson was a leader beloved by all who served under and with him. 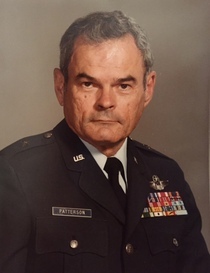 He set high standards and through his leadership the Georgia Air National Guard achieved many firsts and was recognized by the National Guard Bureau, Pentagon, D.C..
General Patterson is preceded in death by his parents Margaret and Ben L. Patterson and his wife Bette Young Patterson of 40 years. He is survived by his beloved sister, Jo Patterson Bettoja, son Ben Lane Patterson, III, and his two daughters, Daphne Patterson Asbury (Blake) and Holly Patterson Belk (Jeff). He is also survived by 3 grandchildren, Devon Asbury, Riley Belk, Andrea Murillo Patterson, several loving nieces, nephews, cousins and longtime companion Betsy Winn. A memorial Service took place at the historic Dobbins Military Chapel located at 1000 Halsey Avenue, Marietta, GA on Saturday, 20 Aug at 1:00 pm.